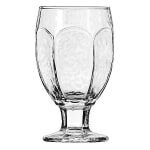 The Libbey 3211 banquet goblet from the Chivalry pattern has an artfully textured surface that creates a unique and subtle visual appeal. To add further interest, the 101⁄2-ounce bowl features an architectural design with tall arches. This glass goblet can be used as a stemmed beer glass, which is ideal for serving dark beers. The glass is also versatile enough to double as a sophisticated water glass. The thick stem provides stability during use, as well as a comfortable grip that helps prevent the transfer of heat from your servers' or patrons' hands to keep the beverage cool. 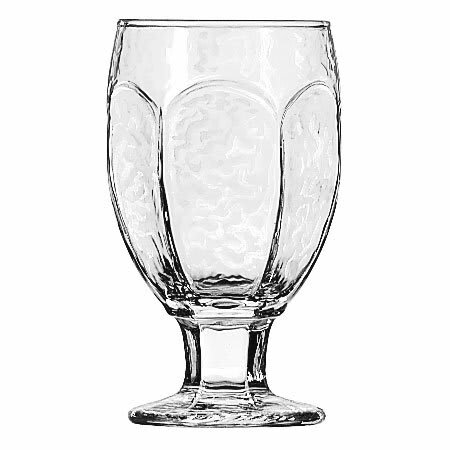 The Libbey 3211 goblet is covered by the Safedge rim and foot guarantee, which helps cover any chipping that might occur on the rim or foot of the glass during standard use in a commercial environment. Overall Dimensions: 53⁄8 in. H x 27⁄8 in. top dia. x 2-3⁄4 in. bottom dia. x 31⁄4 max dia.